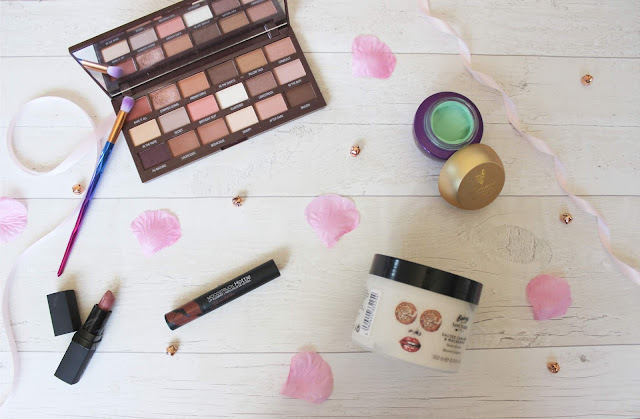 So for this week’s post I thought I would share with you what I’ve been loving in July, of course these are just the beauty items and a few other random favourites but I do a more in depth favourite’s video on my YouTube channel if you’d like to look HERE. So let’s start this by having a little wrap up into how July was for me, I have to say I enjoyed July a lot. I loved the weather and the fact I could escape work for my lunch hour. I loved watching the World Cup with my Mum, Dad and brother and going for family meals. I enjoyed having weekends out but also having weekends in – it’s genuinely been such a lovely month. I got back into my Blog and YouTube in July and adore them as much as I did when I started. I got back into reading and finished 2 books after been in a reading slump for well over a year – Such a lovely month. I Heart Revolution Nudes Chocolate Palette – This palette is by far my go-to at the moment as it just has every shade I need for an everyday look which isn’t too much for work, all the shades are so pigmented and I love the chocolate palettes from Revolution. Younique Moodstruck Opulence Lipstick in Affluent – So I purchased this when I joined Younique in April time as it looked like the perfect shade for me and I’ve genuinely wore it every day since. It’s the perfect shade for everyday and I just love the shade and how easily it applies. Younique Moodstruck Hottie Lip Plumper in Shandelle – 5 new colours were released in July for the hottie lip plumpers and I decided to give this one a go as it was the perfect everyday shade and it’s such a natural shade I just apply this over the top of lipsticks sometimes to give it that glossy finish whilst plumping my lips or apply on its own for a more natural lip look whilst again plumping. Younique Oil Control Mask – I love using a mask on my skin on a Sunday evening as that’s when I have my pamper evening once I’ve done my to-do list. My skin seems to be getting better as I’m sticking to my skincare routine and I’m drinking a lot more water but my oils still need controlling and this mask does wonders to my skin, I apply whilst I’m in the bath and wash off just before I get out. Being By Sanctuary Spa Salted Caramel & Macadamia Body Butter – So I treated myself to this back in June just after my birthday and I’m honestly loving this to add moisture back into my skin and it just smells incredible, definitely going to look into the other bits of the collection. Tom Grennan – Lighting Matches – So Tom Grennan’s album came out in July and I love Tom Grennan so I knew I would love his album and this has been on repeat all month. More Than Enough – Jay McLean – I am loving this series I keep reading each book and that isn’t like me but I just love the characters and the stories. I am currently 70% into this but needed to add it into my favourites. This book has taken over my free time – I love Dylan and Riley’s characters and their relationship, each book just gets better and better for me. Again I will do a review once I have finished it but so far I’m loving it. Lethal Weapon – I adored this when it first started but then kind of forgot about it, recently I started watching it again on a Friday night and just love it. I’m sure it was the season finale a couple of weeks ago now but I’ve decided I’m going to watch from the beginning. Power – I’ve been putting off watching this for a while as I wanted to get into a series properly so I was waiting for the perfect time when I had some free time to start a series and decided on Power, so far I’m enjoying it and I’m looking forward to see what happens. What was your favourites in July?